Lair of the Madhat is a DX11 free dungeon crawler made by Manyhat. This game was made from scratch in 9 weeks. The game is about three friends, a rhino, weasel and a deer on their quest for an unknown treasure. That’s all there is with the story, it’s short and simple. The three have their own separate classes, a warrior, archer and mage. 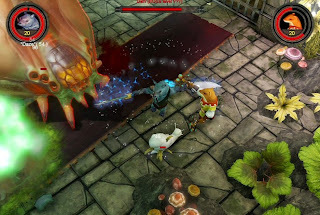 The game is made up of four levels all with boss fights, various monsters and small puzzles. The game is actually quite fun to play either by yourself or with friends in coop mode. While it is fun, the game itself is actually very easy. You can just hold down the right mouse button and destroy anything in your path. For most of the game I held down the right mouse button and only died once throughout the whole story. The puzzles themselves don’t require much thinking, the puzzles that require you to push buttons, you can easily push random buttons and successfully unlock whatever is blocking your path, presumably a gate. One thing you may find annoying is the fact that since the camera is locked with the angle and direction it's facing, some of the walls in all the levels will stop you from noticing anything important. Overall the game is fun while it lasts but it depends on whether your definition of fun consists of a challenge.